MANILA, Philippines – For majority of Christian Catholic Filipinos, March 31 is marked as Holy Tuesday. But for most Filipino Basketball aficionados, it is also the date where the Commissioner’s Cup Semi Finals started. Fresh from their respective and very convincing wins, the league’s top seeded team, Rain Or Shine Elasto Painters and PBA’s Dark Horse – Meralco Bolts lock horns for a best-of-five semis showdown where Coach Yeng Guiao is now one step ahead of his rival, Coach Norman Black for a buena mano 99-86 win on Tuesday, March 31 at the Smart Araneta Coliseum in Cubao, Quezon City. 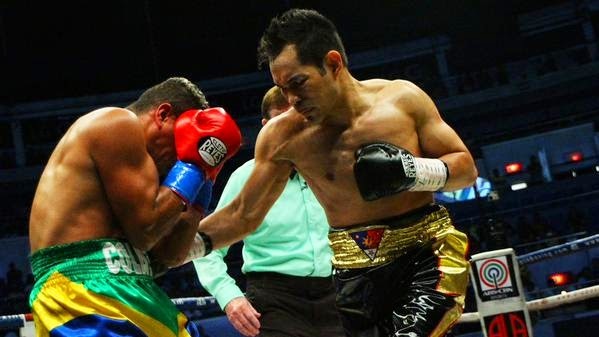 Everybody was looking forward to a Gary David - Jeff Chan shootout, two of Philippines’ top gunners, as early as the first quarter. 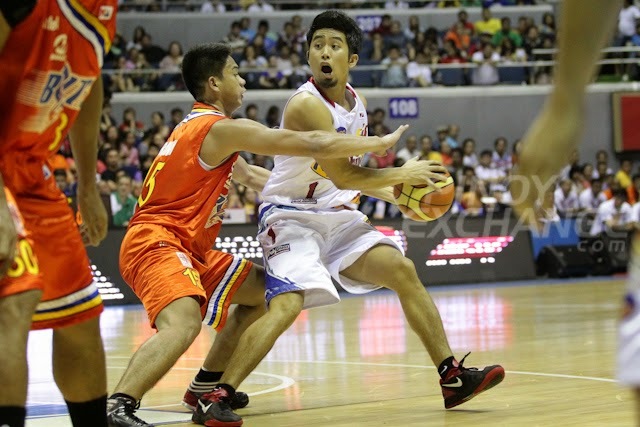 But to the surprise of many, Coach Yeng Guiao started the game with an unusual first five. Instead of Norwood, Chan and Belga, the fiery coach fielded in Jervy Cruz, Jireh Ibanes and Jonathan Uyloan with Paul Lee and Wayne Chism. The less-utilized starters did not waste the very rare opportunity which Coach Guiao has entrusted to them. Jervy Cruz fired a back-to-back perimeter jumpers while Jonathan Uyloan quickly sank a three to forced Coach Norman Black to call a cease fire and re-assemble his squad. The Bolts obediently responded on their Coach’s call and made an 11-2 run to close the gap with just two shots. Paul Lee cut Meralco’s scoring momentum by owning the rainbow country along with the entry of Gabe Norwood, Jeff Chan and Raymond Almazan to protect their margin from the game’s underdogs. Interestingly, the locals of both teams were filling-up the score board while both of their imports were tightly guarding each other and just contributed four points apiece in the second period. Meralco Josh Davis slightly got an advantage over Wayne Chism due to latter’s three personal fouls midway in the second but apparently had an off-night with an unsual 11-point output in four quarters. Reynel Hugnatan sensed Chism was in trouble so he capitalized on it and pounded the Elasto Painters import to the point of sending him sprawling on the floor with a sick up and under move. Gary “El Granada” David and former three point king Mark Macapagal both launched long bombs to tie the game 49 all at the end of the first 24 minutes of the ball game. Frustrated due to his very slow start, Wayne Chism opened the third quarter with a pump fake shot plus one and finally got his scoring rhythm and booked 18 total points, 14 boards, 3 blocks and enough for him to be chosen as the Best Player of the game. But Gary David’s hot hands continued after the half time break for a quick equalizer. The third canto remained too close to call but Coach Yeng’s super subs Jeric Teng, Jerico Cruz and Jonathan Uyloan were giving Coach Norman a headache in all sides of the floor. One of Rain Or Shine’s major advantages over Meralco Bolts is their height. Coach Yeng sent his big boys Raymond Almazan, JR Quinahan and Beau Belga alternating plus their 6’9” reinforcement Wayne Chism for their first ever double digit lead 85-74 with 8 minutes remaining in the final quarter. Meralco big man Reynel Hugnatan had a hard time guarding his counterparts especially in the rebounding department. Both Coaches had heated arguments with the game officials after Gabe Norwood made a three to beat the shot clock with less than four minutes in the fourth but got voided by the referees after reviewing the incident. Norwood sank another trey but this time made sure that it will count and followed by Paul Lee’s fast break layup to maintain their 10 point, 94-84 lead after the two minute warning. Beau Belga placed the icing on the cake by making two foul shots and his only points after getting hacked by Gary David. Coach Norman Black vowed to even the series on Easter Sunday, April 5, 2015. Interesting game fact: All Rain Or Shine players on the Roster scored except for Gilas Pilipinas Shooter Jeff Chan who only played for 5 minutes with 0-1 shooting and probably his career low. 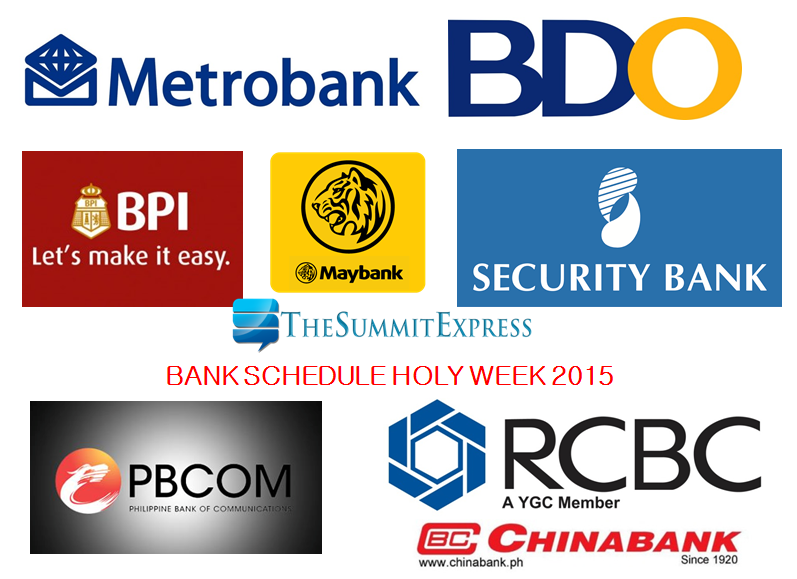 MANILA, Philippines - Major banks in the country announced the banking hours schedule in observance of the Lenten Season or Holy Week this 2015. BDO Unibank Inc. announced that its branches nationwide will be closed from Maundy Thursday to Sunday (April 2 - April 5, 2015) except for NAIA, NAIA 3, BDO Clark Forex Counter, City of Dreams Manila and Solaire Manila Resort which are open on Black Saturday and Easter Sunday (April 4-5). BDO said its ATMs and online banking channels will be operational for withdrawal transactions and other banking services. 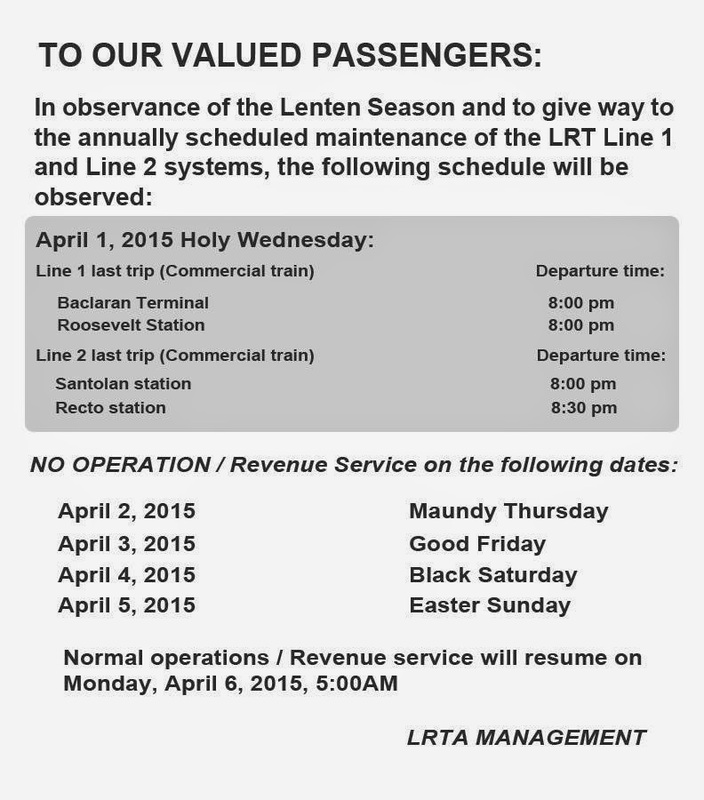 In observance of the HOLY WEEK, branches and kiosks will be closed from April 2 to 5, 2015. Please plan your transactions accordingly. Metrobank said that payments received after April 1, 2015 (Wednesday) shall be processed on April 6, 2015 (Monday). Selected branches will be open during Holy Week. Please refer to this list. If you have queries or require further assistance, please call our Metrobank Contact Center at 8700-700 (domestic toll free 1-800-1888-5775) which will remain in service 24/7 during the entire period. 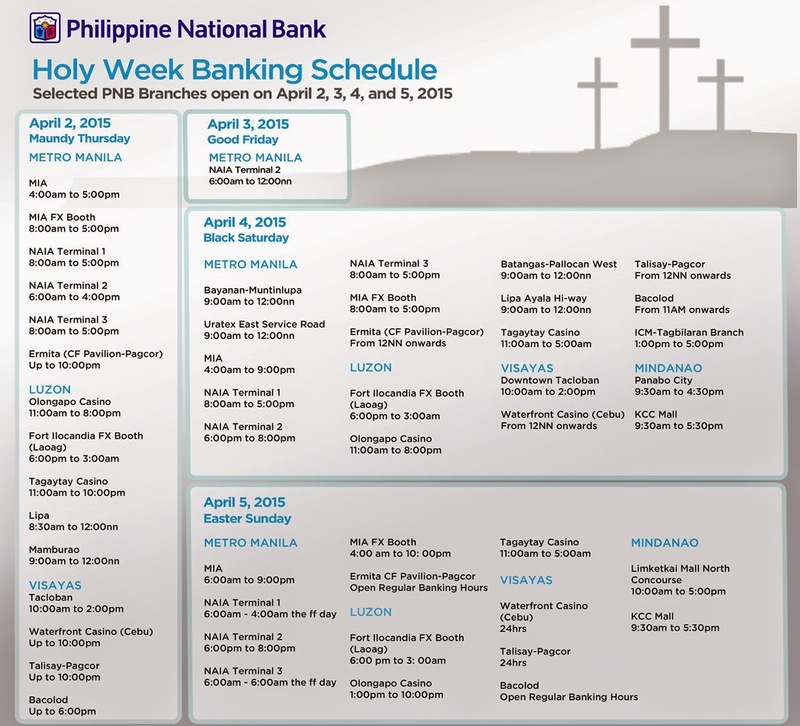 PNB announced on its official Facebook page that selected branches are OPEN on Holy Week. "PNB is open this Holy Week! Selected PNB branches are open on April 2, 3, 4, and 5," PNB said in a statement. All China Bank branches will be closed from April 2 to 4, 2015. Regular banking schedule will resume on Monday, April 6, 2015. The company said China Bank ATMs are available 24/7 nationwide. You may also do real-time transactions via China Bank online (www.chinabankonline.ph), thru the TellerPhone (88-55-888) and thru the China Bank mobile app. Note: SM North EDSA -Annex Branch wil open to serve on Sunday, April 5, 2015. In observance of the Holy Week, Security Bank branches will be closed starting April 2 and normal operations will resume on April 6, Monday. During these days, Security Bank Online and all Security Bank ATMs will be available. Access their branch locator here. All our branches will be closed from April 2-5, 2015, including Maybank Main Office and Resorts World Branches. Regular banking operations will resume on Monday, 6 April 2015. Resorts World Branch will also be open on April 6 at 7:30 am. Schedule for other banks (RCBC and PBCOM) will be posted as soon as available online. Like us on Facebook or Follow us on Twitter for more updates. MANILA, Philippines - The Overseas Workers Welfare Administration (OWWA) officially released recently the results of Education for Development Scholarship Program (EDSP) exam and Congressional Migrant Workers Scholarship Program (CMWSP) exam for AY 2015-2016 conducted last September 21, 2014 in DOST-designated centers in Manila and in the provinces. OWWA has named the top 200 qualifiers or passers of the EDSP out of the 4,734 dependents of active member-OFWs who took the examinations, including the 346 dependents of member-OFWs in the Middle East. The number of awardees under the EDSP was increased to 200 slots starting last year to give opportunities to deserving dependents of OWWA members to continue their studies through the scholarship programs offered by OWWA. According to Administrator Calzado, scholars under EDSP are provided with a maximum education assistance of Php60,000.00 per school year, for bachelor degree courses in any college or university of their choice. “We, at OWWA, are pleased every time that we hear about the achievements of our scholars considering the fact that one or both of their parents are not around to guide them in their studies. Be that as it may, they are able to draw inspiration and strength from the situation. This positive attitude and strong character made them more mature and responsible to do their best and make their parents proud of them, which made them truly laudable,” the OWWA Chief said. Aside from EDSP, OWWA offers other scholarship and training grants to dependents of active OWWA members such as the Congressional Migrant Workers Scholarship Program (CMWSP), OFW Dependents Scholarship Program (ODSP), Education and Livelihood Assistance Program (ELAP), Skills-for-Employment Scholarship-Program (SESP), Skills Upgrading Program for Seafarers (SUP), and Information Technology Program. 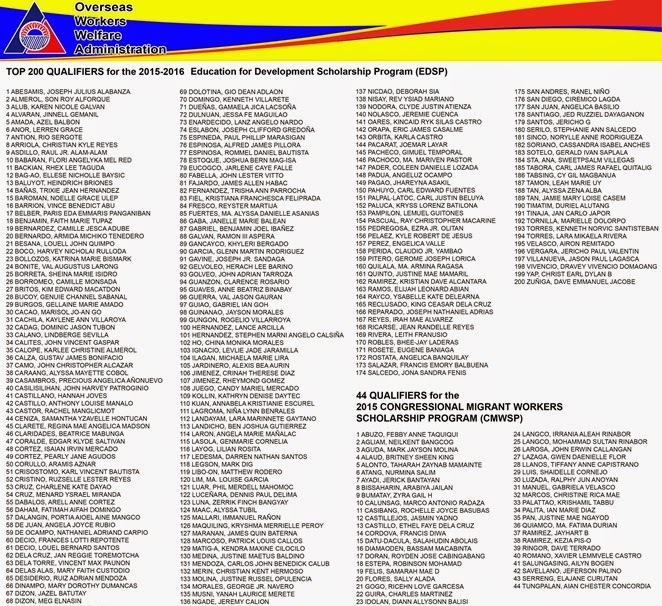 This year, OWWA has named the 44 qualifiers out of the 352 examinees with scholarship grant funded by the Philippine Charity Sweepstakes Office (PCSO). The CMWSP is a 4-5 year scholarship program established under Republic Act 8042 which grants educational financial assistance to deserving migrant workers and/or their dependents, who intend to pursue courses in the field of science and technology identified by the Department of Science and Technology-Science Education Institute (DOST-SEI). Scholars under the program receive assistance of P60,000.00 per school year. RAMON ASPERA GALVAN lll of the Hua Siong College (Ledesco Campus), Region 6, Iloilo City, ranks number 1 in the roster of qualifiers for OWWA’s EDSP Exam. 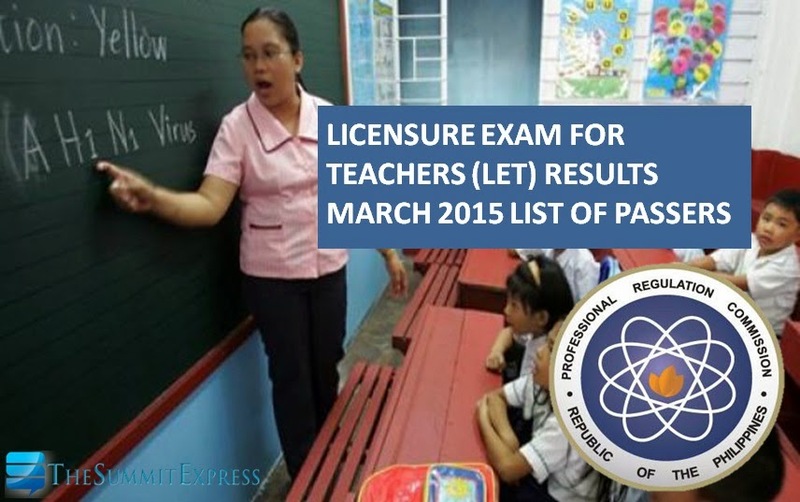 Over-all, NCR ranked number 1 with 40 top qualifiers, followed by 35 from Region lV-A. The regional distribution for the rest were Middle East, 20; Region lll, 17; Region Vl, 16; Region Vll, 14; Region Xl, 11; CAR, 10; Region V, 9; Region l, 6; Region X, 5; Region Vlll, 4; Region ll, 4; Region Xll, 3; Region lX, 3; Caraga, 2; and Region lV-B, 1. Meanwhile, AIAN CHESTER CONCORDIA TUNGPALAN, student of Saint Joseph High School, Flora Apayao, Cordillera Autonomous Region (CAR), is this year’s topnotcher for CMWSP exams. 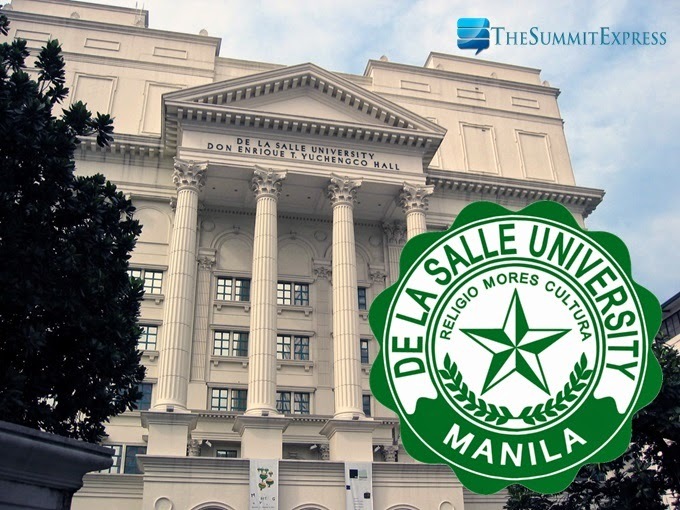 MANILA, Philippines - Largest public research group in Spain, the National Research Council known as CSIC officially released recently the world ranking of universities including the top 200 colleges and universities in the Philippines for 2015. 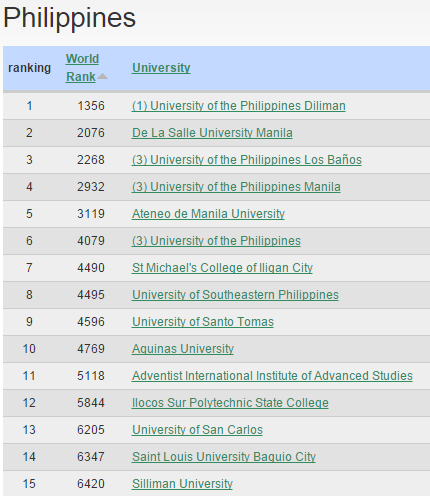 The global ranking arm of CSIC, Webometrics which is now on their 12th year of publication once again named University of the Philippines - Diliman (UPD) as the number 1 institution in the country. UPD ranked 1,356 in the world up by 248 notches from last year's 1,604 out of 23,887 total universities included in the list. The ranking which is based on web presence and impact of various academic institutions was evaluated through a composite indicator comprised of university online visibility in terms of external inlinks and other activities. 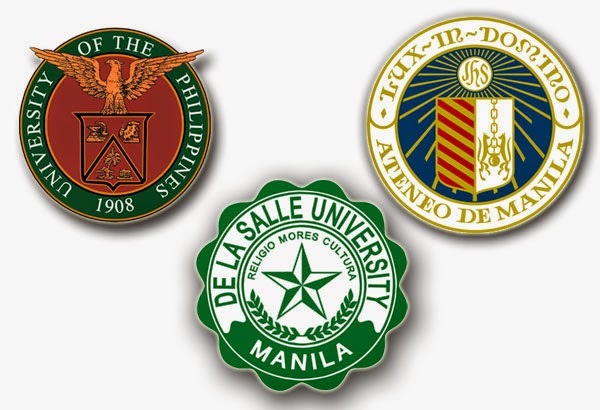 UPD is followed by De La Salle University (DLSU) - Manila, University of the Philippines Los Baños (UPLB), University of the Philippines - Manila (UPM) and Ateneo de Manila University (ADMU). The top 10 list of schools also includes UP System, St. Michael's College of Iligan City (SMC), University of Southeastern Philippines (USEP), University of Santo Tomas (UST) and Aquinas University (AU). National Taiwan University still ranked 1st place among Asian universities while UPD ranked 393th up from 479th in 2014. Harvard University, Massachusetts Institute of Technology and Stanford University in the United States (US) dominated this year's global ranking. Currently, composite indicator measures 50% VISIBILITY for the impact based on academic performance and another 50% for ACTIVITY which compose of presence or the total number of webpages hosted in the main webdomain of the university, openness or the global effort to set up institutional research repositories and excellence or academic papers published in high impact international journals. SCIC said that the aim of the ranking is to improve the presence of the academic and research institutions on the Web and to promote the open access publication of scientific results. The central hypothesis of Webometrics is that web presence is a reliable indicator of the global performance and prestige of the universities and as such, is an indirect way to measure all the university missions (teaching, research, transfer).